""Decibels Of Gratitude" is the eighth full-length studio album by this long running Massachusetts ensemble. The roots of Major Stars go back to the 1979 formation of Crystalized Movements, through to their early '90's successor Magic Hour. Upon that band's breakup guitarists Wayne Rogers and Kate Village formed Major Stars, which kept Magic Hour's tendency toward songs spiked with lengthy instrumental excursions but added a hard rock angle not usually present in the Hour's hazier sound. Major Stars released four albums as a quartet before expanding to a sextet with 2003's "Syntoptikon," moving secret weapon Tom "Luxurious Bags" Leonard to third guitar and adding Dave Dougan and Casey Keenan as the rhythm section. Another change was adding a singer, thus finally allowing all of the guitar players to concentrate solely on six-string matters. They followed this with two albums for the Drag City label that presented a more stripped down aesthetic with shorter, riff-driven songs. On "Decibels Of Gratitude" (their first album with new singer Hayley Thompson-King) they stretch it out again, delivering 5 songs in just over 40 minutes but as always keeping an eye on the balance between folk-rock and freakout. What to say about a band who continuously claims Otis Rush and Buddy Guy as it's primary influences, but usually finds their records filed in the "noise/experimental" bin? Any mention of Major Stars tends to send some scurrying for the most obscure psychedelic references, but one need look no further than the Who or Cream to find the primary ingredients of melodic songwriting combined with an over-the-top instrumental assault. As a few noticed, the title of their last album "Return To Form" wasn't entirely intended to be tongue-in-cheek. Their music seems to be more "psychedelic era" than "psychedelic," and they themselves like to just be thought of as a Rock group (early '70's capitalization intact). But there has always been something different about their arrangement of common influences compared to their contemporaries, and over the past fifteen years they have developed a loyal base of followers who seem to quite like the way they put things together. 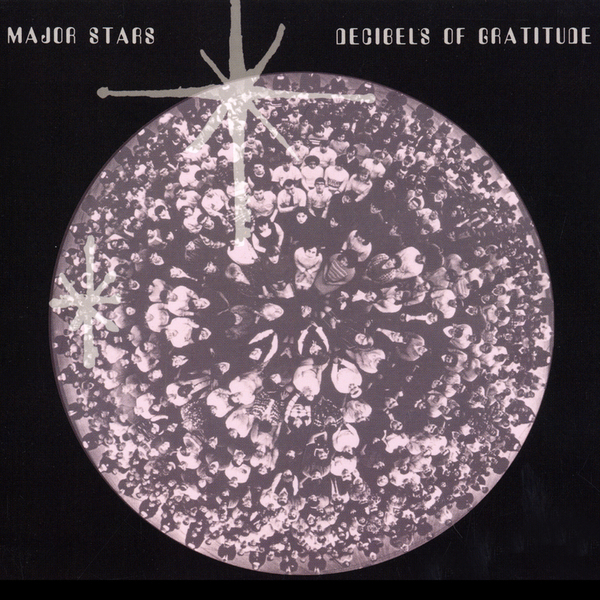 So Major Stars continue to put it together, like on this one: "Decibels Of Gratitude," from them, to you."